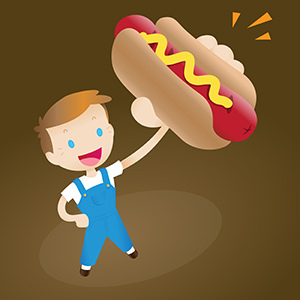 Boy Holding a Hot Dog — Cute retro-style vector illustration of a young boy in overalls holding up a juicy, delicious-looking hot dog with mustard in the air. .:. My-Free-Vector-Art.com .:. Cute retro-style vector illustration of a young boy in overalls holding up a juicy, delicious-looking hot dog with mustard in the air.